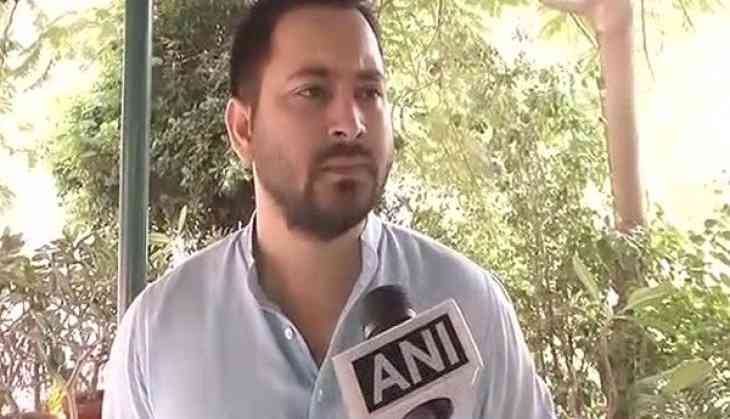 Rashtriya Janata Dal (RJD) leader Tejashwi Yadav, who met Bihar Governor Satyapal Malik to stake claim to form a government in the state on Friday, has urged all the opposition parties to come together to oppose the BJP-led central government's 'dictatorship' in the country. "All the opposition parties need to come together and raise voice against what is being done by BJP across India. We need to oppose their dictatorship. If something is not done now, then soon there will be no Constitution. The Britishers came to India and treated us like slaves. Now BJP is doing the same," Tejashwi Yadav said at the 'Samvidhan Bachao Andolan' rally here on Friday. He added, "The BJP leaders will not follow any of the Consitution rules as they feel Prime Minister Narendra Modi is bigger than Constitution. "If the Consitution is same for all, then why Karnataka is different from what happened in Bihar?" he asked. Earlier on Friday, Tejashwi along with other alliance leaders handed over letters to the Governor, stating that they were the single largest party elected in 2015 Bihar Legislative Assembly election and hence should be invited to form a government in the state. Talking about the same, he said at the rally: "We were not given time to say anything when Nitish Kumar allied with BJP to form government in Bihar. The Governor fell ill when we were supposed to meet him. Soon, BJP and Nitish joined each other and formed government after Governor resumed office." "They fooled 12 crore population of Bihar. In four years, Nitish Kumar formed government with four different partiers. He is hungry for power," he added.